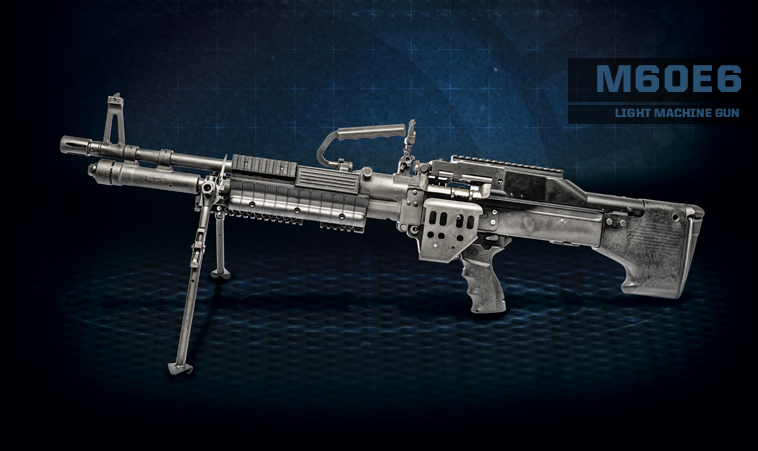 The 7.62mm NATO M60E6 General Purpose Machine Gun (GPMG) represents the latest improvements to the M60 Series of machine guns. It is a gas operated, disintegrating link, belt fed, air-cooled machine gun. It fires from an open bolt and features a quick-change barrel. The M60E6 features a machined aluminum feed cover with integrated M1913 Picatinny rail for mounting optics. An aluminum M1913 rail handguard provides for the mounting of infrared laser aiming devices and other sensors, giving the weapon 24 hour capability. Light and compact design provides increased mobility and allows for accurate off hand (shouldered) direct fire support. Multiple M1913 rail mounting points for mounting optics, aiming lasers, and accessories. Stellite®-lined sustained fire barrels for extended barrel life. Available in short or heavy fluted configuration for application flexibility. Controllable yet lethal rate of fire allows for accurate firing in offhand, kneeling, and prone positions. All major components are directly interchangeable with other M60 configurations. Mounts directly or adapts to all standard NATO tripod and vehicle mounts. Simple and easy to maintain gas system with reversible gas piston. Adjustable front sight allows zeroing of primary and spare barrels. Offset barrel handle provides a clear sight picture and eliminates the need for a heat mitten for barrel changes. Lightweight forearm/pistol grip for improved control with (3) M1913 rails for mounting aiming lasers and accessories. Hard chrome and induction hardening of oprod tube facilitates easier cleaning and increases the service life of the receiver. 30% improved belt pull provides increased reliability in harsh, dirty environments. Forged 7075 Aluminum topcover with M1913 rail for mounting of optics. Ergonomic pistol grip with storage compartment and Improved trigger for use with gloves. New “captured pin” latch securely holds trigger assembly to receiver. Receiver mounted ammunition hanger provides a stable and secure mounting point for ammunition pouch and isolates the feed tray from accidental damage. Lightweight and ergonomic buttstock with hinged shoulder rest. Quick detach sling mounting points.